Last weekend was a holiday long weekend here in the Emirates. Matt and I decided we wanted a getaway. But we didn't want all of the hassle and added stress that a long haul flight brings with it. So where better than Muscat, the capital of Oman? Oman is a relatively large country that borders the UAE, among others. It hugs the coast of the Arabian Sea and makes up the bulk of the eastern Arabian peninsula. Only a 45 minute flight from Abu Dhabi and on the same time zone, it is super close meaning we could be to our destination, door to door, in less than 3 hours. Very close but when you step off the plane you feel like you really are somewhere different. And it immediately feels different. Although many of the buildings as you make your way towards Muscat from the airport bear a resemblance to those in the UAE, the atmosphere is very relaxed; you interact with the locals from the point you step into your taxi as, in our case, an Omani gentleman was our taxi driver. We drove towards our resort with the taxi driver pointing out a few sights on the way, among them the Grand Mosque; a beautiful sand coulored structure with a giant minaret towering over the courtyards. Another 10 minutes and we arrived at our resort: The Chedi. It was beautiful as we weaved our way up the long driveway; low rise white wash buildings in the Arabian style. We were greeted on arrival and ushered into the lobby which is a giant tent with red and white lights and an atmosphere thick with that mysterious aroma of burning Frankincense. We were quickly taken to our room: stylish and relaxed with a view out over the expansive lawns to the waters of the Gulf of Oman in front of us. We didn't waste any time; we changed and made our way down to one of the three pools for lunch. The food was delicious (right down to the home-made chocolate selection), a theme that was repeated throughout our stay at The Chedi. After lunch and a couple of glasses of red-grape we retired to the pool side loungers to laze for the rest of the afternoon. The rest of our stay was a slight variation on the same pattern. We alternated between the 100m long adults' only pool, which incidentally served outstanding Japanese food which we enjoyed on the massive poolside beds and the beach-side infinity pool where you could enjoy the pool and beach at the same time. The Chedi also has an amazing gym. We are exercise freaks and so we never go anywhere without checking out the gym at least once. The gym at The Chedi was among the best we have seen. Full of the latest and greatest Kinesis equipment and any other piece of kit you might want. 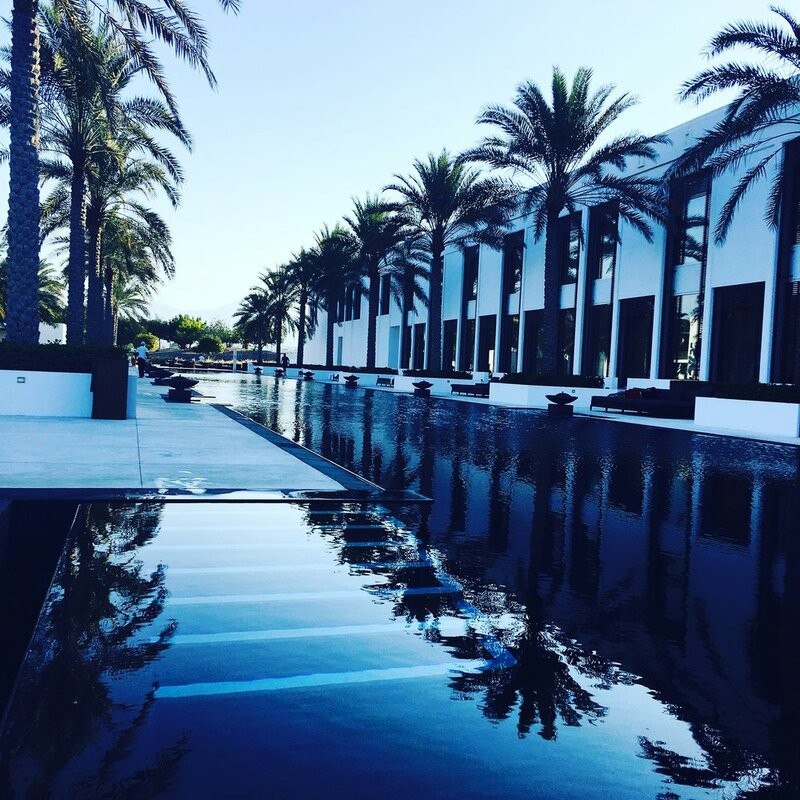 We loved our three days of relaxing by and in the pool at The Chedi. In fact, the true mark of how lovely we thought it was is that before we left we had already booked our next stay - we are heading back in late January. For those of you here in the Emirates, try it. It is close enough for a weekend and offers something different to the Dubai and Abu Dhabi hotels and resorts. For those of you further afield, try Oman. It is a beautiful place, diverse landscapes, great people, culture and an interesting history. And if you do go, go for The Chedi. It is pricey but very special. Finally, you may have noticed that the blog has been a bit quiet of late. This is not my tardiness. No. I have been working on the immaclife website which will go live soon. I will keep you posted as we move towards the go-live date.